Welcome back to our blog! With spring just around the corner, it’s hard to believe it’s that time of year again — that wonderful time when homeowners break out the cleaning supplies for a deep cleaning of their homes in preparation for the warmer months ahead. With all the rain we’ve been getting here lately in Greensboro, we’re likely in for a colorful spring when all the springtime flowers and plants begin blooming. But along with the joys of blooming flowers and the rejuvenation of life that spring brings, new insects and critters will also be emerging to mate, build nests, and search for food sources in the weeks ahead. Here are some helpful spring cleaning tips for preventing insect and pest infestations in your home this spring. There is simply no escaping those rogue crumbs and food particles that disappear under your cupboards and appliances. These food items will attract a whole swath of hungry insects and rodents, including ants, flies, and mice. Your pantry also becomes a 24-hour buffet for common house pests if your food isn’t stored properly. As you clean your kitchen this spring, be sure to clean under and behind all of your kitchen appliances, including the toaster oven and microwave. You’ll want to remove any dropped crumbs and other debris buildups that attract pests. Also, purge your pantry, tossing out any expired foods, empty bags and boxes, and other objects that may be collecting dust. Vacuum and scrub your drawers and cabinets with a strong cleaner, bleach and water, or vinegar and dish soap to remove dirt and crumbs. You might consider getting airtight plastic or glass containers for securely storing your pantry foods to keep bugs and rodents out. Bathrooms are not immune to pests. In fact, many insects like ants, cockroaches, fruit flies, and spiders will climb up the drains and vents and make your bathroom their home. Bathroom closets and drawers are often cluttered, making them the perfect place for insects to hide. And with all the spilled hair product, sweet-smelling lotions and perfumes, and other attractive scents, many insects will be drawn to these aromas. Throw away any expired or unused toiletries and thoroughly clean your bathroom storage spaces afterwards. Be sure to wipe down all surfaces using a strong bathroom cleaner to remove spilled toiletry products that might attract pests. Use bleach or an enzymatic drain cleaner to remove buildup in your bathroom drains. Vacuum out vents and wipe down all bathroom surfaces regularly to keep the bugs away. If you notice signs of insects or rodents during your spring cleaning adventure, call Ray Pest Control for a pest inspection and pest prevention. As Greensboro’s Top Rated Local® pest control company, we can prevent the spread of a bug or rodent infestation by stopping it in its early phases. 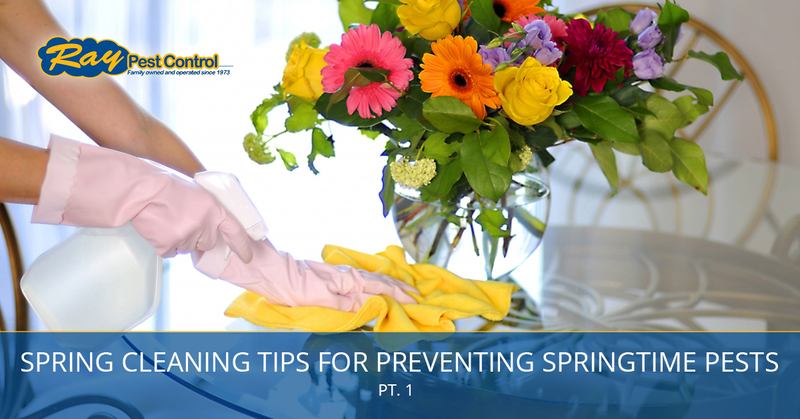 Contact us today to make an appointment, and be sure to check back for part two of our blog series to learn more tips for preventing a springtime pest invasion.